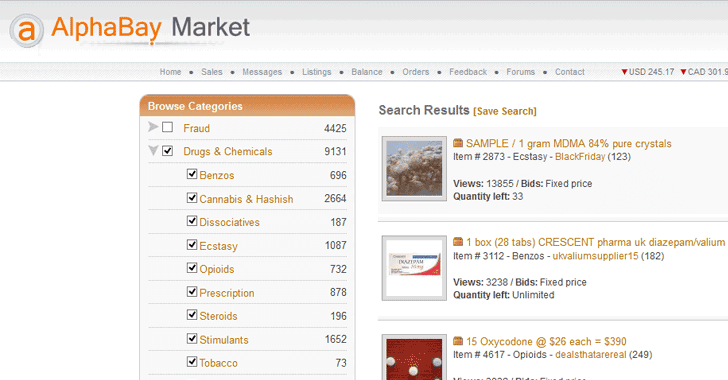 AlphaBay Market, one of the largest Dark Web marketplaces for drugs, guns, and other illegal goods, suddenly disappeared overnight without any explanation from its admins, leaving its customers who have paid large sums in panic. AlphaBay, also known as "the new Silk Road," has been shut down since Tuesday night. The site also came in the news at the beginning of this year when a hacker successfully hacked the AlphaBay site and stole over 200,000 private unencrypted messages from several users. Although the website sometimes goes down for maintenance, customers are speculating that the admins have stolen all their Bitcoins for good measure, when heard no words from the site's admins on the downtime. Some users at Reddit and Twitter are claiming that AlphaBay's admins may have shut down the marketplace to withdraw a huge number of bitcoins from the site's accounts. The withdrawal Bitcoin transactions total 1,479.03904709 Bitcoin (roughly $3.8 Million), which led to suspicion from some users that the site’s admins may have pulled an exit scam to steal user funds. In March 2015, the largest (at the time) dark web market 'Evolution' suddenly disappeared overnight from the Internet, stealing millions of dollars worth of Bitcoins from its customers. However, users no need to worry—at least right now when nothing is confirmed, and the timing of the two incidents—site downtime and Bitcoin withdrawals—may be just coincidental. This is not the first time AlphaBay goes offline. Last year, the site went down for about four days. Also, the blockchain transactions of about $3.8 Million are not enough for AlphaBay moderators to go offline. One user on Reddit calls for calm and patience, saying "Now I'll admit I don't know for sure what's going on, and I am a bit nervous myself because if this is the end then I've lost a couple of hundred dollars myself But think about it Last year alphabay went down for about 4 days." "Everyone was saying for sure that this was it, but it was not. It took the alphabay moderators days to update people on what was going on too; they're known to do this. Also about that blockchain transaction.. 44 bitcoins rounds off to about 4 million US. [I don’t know] about you but that doesn't sound like nearly enough money." While AlphaBay continues to be down, and AlphaBay-associated Redditor who goes by moniker Big_Muscles has called users to calm down, saying the site's servers are under update and will be "back online soon." Also unlike Silk Road, there is no indication that the law enforcement took down the AlphaBay marketplace. Silk Road was shut down in 2013 after the arrest of its unassuming founder, Ross William Ulbricht. The FBI seized bitcoins (worth about $33.6 million, at the time) from the site, which were later sold in a series of auctions by the United States Marshals Service (USMS).